The news is out – the current Gnome branch  is getting old, slowly but surely, and the time is right to think about a major version change. At the Gnome Users' and Developers' European Conference (Guadec) , which took place in Istanbul early in July 2008, Gnome developers looked into their options for Gnome 3.0. The result is that the number before the dot will change after version 2.28. Of course, a major new version necessitates changes to the underlying Glib and Gtk+ libraries; however, the developers are just planning clean-up work in the form of API consolidation for the first major 3.X release. The first evidence of this library upgrade is Glib 2.18 or Gtk+ 2.14, the underpinnings for Gnome 2.24. It is not entirely clear whether the new Gnome really will be around in two years; in the meantime, work on the current Gnome components is continuing at top speed. The tried and trusted architecture, which has been around for more than six years, is far from the end of its tether. In Gnome 2.24, the developers have again focused on details – and on the stability of the libraries and programs added last spring. In addition to the stability enhancements, improvements to the Nautilus  file manager and new tools, such as the Empathy Instant Messenger client  and the Hamster time management applet , reveal that this desktop is still in its prime. The Nautilus developers have introduced some very visible changes. For many years, users have asked for a split view (see the "Split View" box), and both developers and usability experts have turned down this request many times. The new tabbed mode included with tools such as the Epiphany  web browser (Figure 1) and the Gedit  text editor is a more open response to a similar idea. Users can press the keyboard shortcut Ctrl+T to open a new tab in a style reminiscent of Firefox. Figure 1: The new tab feature lets users drag and drop files between individual tabs. 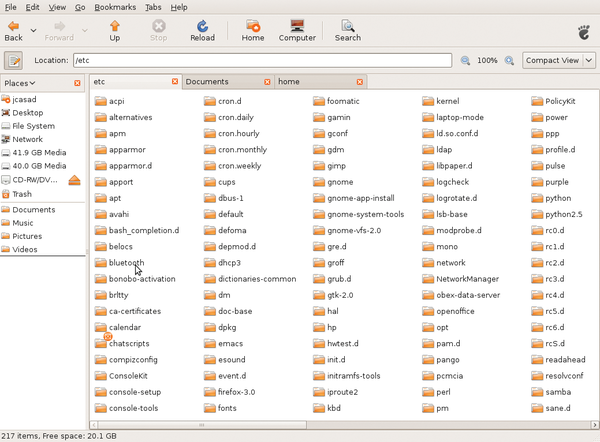 File managers typically display the contents of one directory per window. 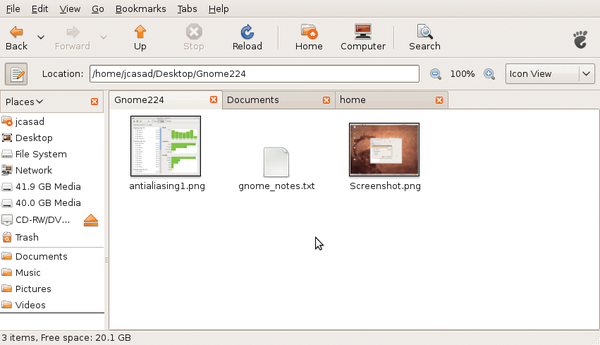 In split view mode, which Gnome Commander  and other programs offer, the tool displays two folders adjacently in a single window. In many people's opinion, this makes file operations easier. Tabbed view, which is only available in browser mode, supports drag and drop: Dragging a file or folder to another tab causes Nautilus to move the tab into the foreground. Of course, actions between windows work too. The developers have also added a space-saving compact view (Figure 2), and the file manager now supports all the view modes that its competitors offer. Figure 2: Nautilus' compact view displays far more objects in a single window. In previous versions, files or folders with long names tended to mess up the way icons were grouped. This phenomenon is a thing of the past: Nautilus now displays the first three lines of the file or folder name. Experienced users might want to use the GConf /apps/nautilus/icon_view key to change the default number of lines. The eject icon for removable media – such as USB sticks or iPods – is another new feature. Clicking the icon tells the computer to unmount the medium. In the past, copying data from FAT32 partitions caused trouble if the filenames included non-standard characters. Nautilus would tend to trip over its own feet and fail to copy the files. The new version removes this issue, at the same time implementing the Freedesktop specification for the trash can. Files a user deletes accidentally are restored to their original paths. Nautilus remembers the original filesystem location of every file or folder. If you want to add files to an archive called test.tgz, you can just drag the files to the icon and drop them on it. Internally, Nautilus launches File Roller , which handles the remaining tasks. The developers have also corrected some errors in Nautilus. Gio and GVFS, which replaced the legacy GnomeVFS last spring, now work more reliably. Right now, about 90 percent of programs rely on the new virtual filesystem library – perfect conditions for finally burying GnomeVFS sometime in the near future. The latest release fixes many bugs in the Totem  multimedia player, which now not only plays movies and audio files, but also YouTube videos. Totem also offers support for digital TV (DVB). Fans of home entertainment PCs no longer need to waste time configuring the remote control (LIRC). LIRC support now works for most remote controls out of the box. The media player thumbnailer now uses cover art – if it finds it – for movies, too. Calculator: Deskbar evaluates requests such as 2*78-6*1.5 directly and returns the results along with the request. Google Search: An alternative to Yahoo search. Note that you need an external package for this (python-simplejson) on Ubuntu. Google Code Search: An interesting plugin for developers that searches for functions in public source code. Yahoo Suggestions: Makes suggestions on the basis of requests entered by the user. Wikipedia Suggests: Similar to Yahoo Suggestions; searches Wikipedia pages for suggestions. Twitter and identi.ca: Support for blogging services. On top of these add-ons, Sebastian Pölsterl has integrated Capuchin , a background service that downloads and installs plugins. 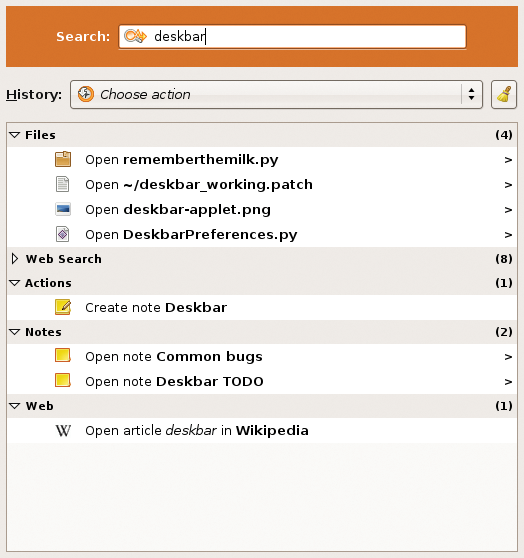 Figure 3: Deskbar integrates search tools with helpful desktop apps such as Tomboy. The Gnome project has published plans for 2.24 and future versions of its desktop environment.